I “borrowed” the title for this recipe post from Shashi Bellamkonda‘s Carry On Curry, because I knew he wouldn’t mind (you don’t, right, Shashi?). If you haven’t read CoC, you should check it out, it’s great fun and extremely valuable for foodies in the DC metro area. Koftas are basically the Indian version of meatballs. Just like the feringhis, we rarely eat them without some kind of gravy (or curry, which means many more things to us than a spice or herb). But we’ll often pair them with a vegetable, dal and rice and/or rotis (tortillas are an ok substitute) to make a really hearty meal. 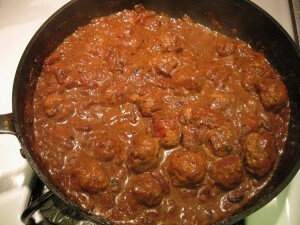 Here’s my recipe for kofta curry, a classic Indian comfort food. Koftas: 1 lb. ground lean turkey (or meat of your choice); ½ cup chopped cilantro; 1 tsp cumin seeds; ¼ tsp turmeric powder; ¼ tsp salt; pinch chilli pepper; ½ tsp ginger paste; ½ tsp coriander powder. Enough oil to deep fry the koftas. Curry (gravy): 1 tbsp cooking oil; 2 red onions, chopped; 1 cup plain non-fat yogurt, beaten with a spoon until it’s smooth; ½ tsp turmeric powder; 1 tsp garam masala; 1 can plain diced tomatoes (or 1-2 fresh tomatoes, diced);¼ tsp chilli powder; ½ tsp salt (or to taste). Mix all the ingredients for the koftas well and make them into fairly small balls. Heat enough oil to fry them in a large pan. When oil is smoking, drop them in and fry them until well-cooked (this will happen fairly quickly if you use turkey or chicken). Set aside, using paper towels to drain excess oil. In a pan (or you can use the same one, just clean it up) heat cooking oil. Add chopped onions and brown over medium-high heat, stirring often (otherwise they’ll burn). Once onions are browned, add powdered spices and stir for a couple of minutes. Reduce heat to medium-low and add yogurt, mixing until well blended. Finally, add tomatoes and cover, stirring occasionally, until tomatoes are cooked and you have a nice thick gravy. Once the gravy is at the consistency you like, add meatballs and stir for a few minutes. VoilÃ – you’ve just made kofta curry! Notes: If you’re concerned about the amount of oil involved in deep-frying the meatballs, you could try brushing the meatballs lightly with oil and then baking at about 400° in the oven (but I haven’t tried this yet, so I can’t tell you how it would turn out). I like to serve this with aloo gobhi or something similar. If you try this, do let me know how it turns out. Are there meatball dishes in other cuisines you’d like to share? I’d love to know.